Planet Aid Supports Cinderella Day 2014 - Planet Aid, Inc. Planet Aid is proud to be supporting Dream Center of Gaston County's 2014 Cinderella Day! 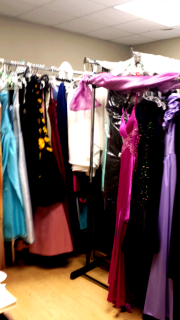 Cinderella Day provides an opportunity for local teens in need to select a dress, shoes, and accessories for Prom Night! The Dream Center of Gaston County has been accepting formal dresses, shoes, purses, jewelry, and salon services for the event. Planet Aid donated 18 pairs of brand new glitter pumps and two large boxes of sequined tops and skirts in support of this wonderful event. Cinderella Day 2014 is taking place on March 29th, 10:00 am to 1:00 pm at Bethlehem West Campus on 2782 Fairview Drive in Gastonia, North Carolina. For more information, contact Cassandra Farmer at 704.396.6925. Click here to see the Facebook event.